It wasn’t my intention to go sketching in the National Museum, but I somehow ended up wandering around the galleries in search of something to doodle. Imagine my surprise when I encountered a ‘Sketches of the World’ exhibition tucked away on the basement level. Imagine my disappointment at the rather small extent of the display, which was about the size of a couple of table-tennis tables. Nonetheless, there were one or two sketches that were most inspiring, particularly one by Ken Lee Chwee Leng entitled, ‘Authentic Coffee Stall Setting’. 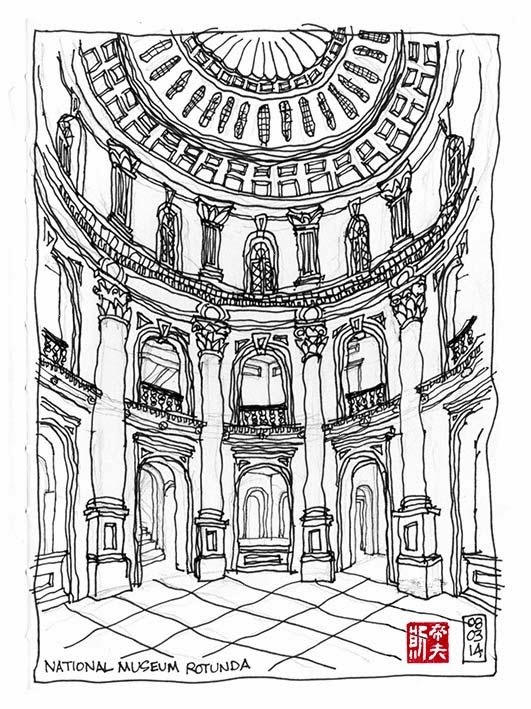 I settled down on the floor of the rotunda with my back to the wall and spent the next hour scratching away with only minimal disruption from a security guard who kept wandering past to check on the progress of the sketch. Every so often, small groups of people in posh frocks and high heels teetered past the recumbent scribbling tramp on their way to a wedding reception taking place in the Flutes restaurant. As I came close to finishing, a group of brightly-coloured schoolchildren laden with rucksacks shattered the silence of the rotunda. One girl came over and took a photo of the sketch. Moments later she returned with a friend who also took a snap on her phone. Very strange, particularly as it's my least favourite attempt of the last few weeks. 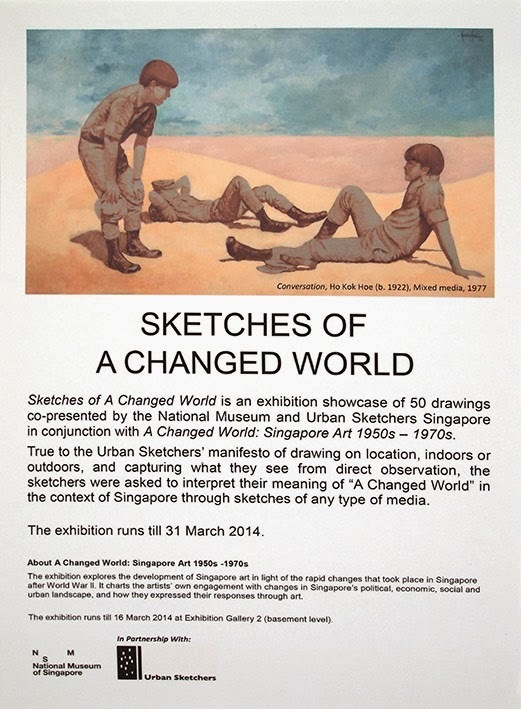 The exhibition, which runs until 31 March 14 is co-presented by the Urban Sketchers of Singapore. Click here for more information about their activities.